The annual expert exploration of Gorham’s Cave is well under way, but the access to the potential World Heritage Site is an arduous daily trek for the volunteers, as it was for the local media when they were invited to see what was happening down there. Our Gibraltar Museum guide, Dr Geraldine Finlayson, told the half-heat-stricken press corps that we were lucky, as the volunteer archaeologists not only have to make the journey twice a day, but they also carry their food, water, equipment, and petrol for the generators down with them, and then lug sacks of samples back up. 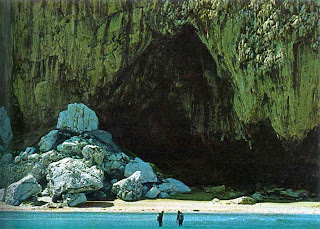 No wonder they opt to spend their lunch break down there in the shade of the cave’s massive entrance. In fact, all food is eaten outside to avoid contamination of the cave floor. Circular earthworks dating back to the stone age have been discovered on the North Downs in Kent. The henge was found after satellite images were studied by archaeologists. 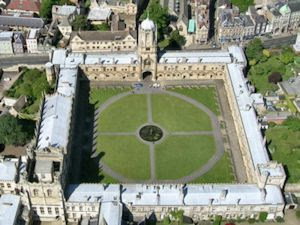 The circle is about 50m across and archaeologists said bones discovered in the area suggest it was a religious site. When scientists discovered a few years ago that modern humans shared swaths of DNA with long-extinct Neanderthals, their best explanation was that at some point the two species must have interbred. Now a study by scientists at the University of Cambridge has questioned this conclusion, hypothesising instead that the DNA overlap is a remnant of a common ancestor of both Neanderthals and modern humans. When the genetic sequence of Homo neanderthalensis was published in 2010, one of the headline findings was that most people outside Africa could trace up to 4% of their DNA to Neanderthals. This was widely interpreted as an indication of interbreeding between Neanderthals and early Homo sapiens just as the latter were leaving Africa. The two species would have lived in the same regions around modern-day Europe, until Neanderthals died out about 30,000 years ago. A MAN who is leading a dig at a site in Monmouth says he's found evidence to dispute claims by a minister who claimed remains there were not Bronze Age. Steve Clarke of Monmouth Archaeology says latest scientific results from the Parc Glyndwr site shows the area was teeming with prehistoric activity, especially during the bronze ages. Mr Clarke claims the development refutes comments by heritage minister Huw Lewis that what had been found at the Rockfield Road site was from a later period. Neolithic Man: The First Lumberjack? During the Neolithic Age (approximately 10000–6000 BCE), early man evolved from hunter-gatherer to farmer and agriculturalist, living in larger, permanent settlements with a variety of domesticated animals and plant life. This transition brought about significant changes in terms of the economy, architecture, man’s relationship to the environment, and more. Now Dr. Ran Barkai of Tel Aviv University‘s Department of Archaeology and Ancient Near Eastern Civilizations has shed new light on this milestone in human evolution, demonstrating a direct connection between the development of an agricultural society and the development of woodworking tools. An upper skull found in 1972 and a newly discovered lower jaw are both thought to belong to the enigmatic hominin species Homo rudolfensis. 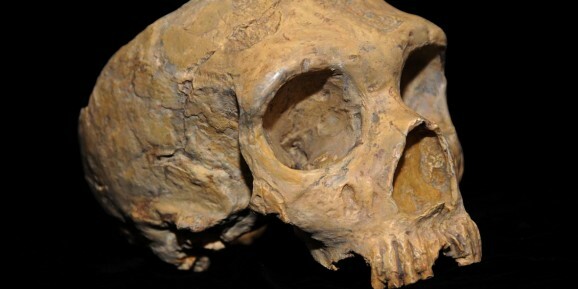 Fossilized skulls show that at least three distinct species belonging to the genus Homo existed between 1.7 million and 2 million years ago, settling a long-standing debate in palaeoanthropology. 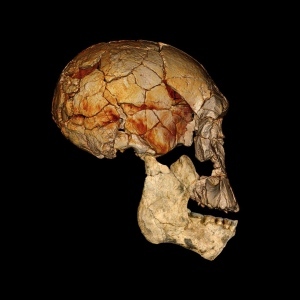 A study published this week in Nature1 focuses on Homo rudolfensis, a hominin with a relatively flat face, which was first identified from a single large skull in 1972. Several other big-skulled fossils have been attributed to the species since then, but none has included both a face and a lower jaw. This has been problematic: in palaeoanthropology, faces and jaws function like fingerprints for identifying a specimen as a particular species (which is indicated by the second word in a Linnaean title, such as 'rudolfensis'), as opposed to the broader grouping of genus (the first word, as in'Homo'). Without complete skulls, it has been difficult to reach a consensus on whether specimens attributed to H. rudolfensis are genuinely members of a distinct species, or actually belong to other Homo species that lived around the same time, such as Homo habilis or Homo erectus. Understanding how many different Homo species there were, and whether they lived concurrently, would help to determine whether the history of the human lineage saw fierce competition between multiple hominins, or a steady succession from one species to another. Die Funde - ein Gesichtsschädel, ein bemerkenswert vollständiger Unterkiefer und der Teil eines zweiten Unterkiefers - werden in der renommierten Fachzeitschrift Nature am 9. August 2012 beschrieben. Ausgegraben wurden die Fossilien zwischen 2007 und 2009 im Rahmen des von Meave und Louise Leakey geleiteten Koobi Fora Forschungsprojekts (Koobi Fora Research Project, KFRP). Fred Spoor, KFRP-Mitglied und Wissenschaftler der Abteilung Humanevolution am Max-Planck-Institut für evolutionäre Anthropologie koordinierte die wissenschaftlichen Untersuchungen der Fossilien. Zahlreiche Analysen wurden in Leipzig durchgeführt, darunter auch die virtuelle Rekonstruktion der neuen Funde mittels modernster Computertechnologie. Invisible to the human eye, cryptotephra is a fine volcanic glass that is blasted out of erupting volcanoes along with ash. It leaves behind a hidden layer, in the earth, which has now been detected, giving clues about why the Neanderthals died out. About 40,000 years ago, a layer of cryptotephra particles carpeted a huge area of Central and Eastern Europe after a massive volcanic eruption in Italy called the Campanian Ignimbrite (CI). This eruption, and the resulting environmental and climatic disruption, has been suggested as a factor in the extinction of the Neanderthals. Interaction with us, modern humans, is one of the other possibilities. 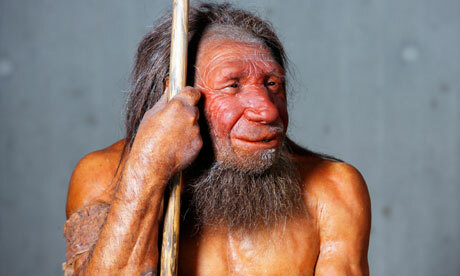 Neanderthals, who were our closest relatives, had been living in Europe for hundreds of thousands of years. But all physical evidence of them disappears after about 30,000 years ago. Early modern humans were known to have arrived in Europe at least 35,000 years ago, having originated in Africa, but precise dates, and the length of time they overlapped with the last Neanderthals, are unclear. 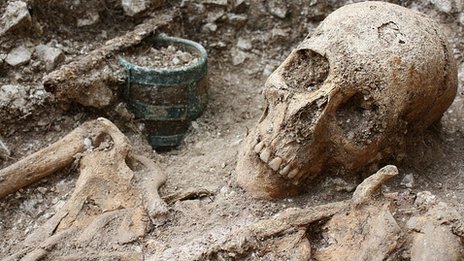 Soldiers have unearthed 27 bodies during an archaeological dig on Salisbury Plain. Troops from The Rifles, injured in Afghanistan, were excavating the 6th Century burial site at Barrow Clump, as part of a programme of rehabilitation. The bodies, including Anglo-Saxon warriors, had been buried with a range of personal possessions. Rifleman Mike Kelly said: "As a modern day warrior, unearthing the remains... fills me with overwhelming respect." By the gap in a hedge bordering the entrance off a muddy lane in Hampshire, the young diggers on one of the most fascinating archaeological sites in Britain have made a herb garden: four small square plots. The sudden blast of sunshine after months of heavy rain has brought everything into bloom, and there’s a heady scent of curry plant and dill, marigold and mint. Many of the plant seeds are familiar from Roman sites across Britain, as the invaders brought the flavours and the medical remedies of the Mediterranean to their wind-blasted and sodden new territory, but there is something extraordinary about the seeds from the abandoned Iron Age and Roman town of Silchester. 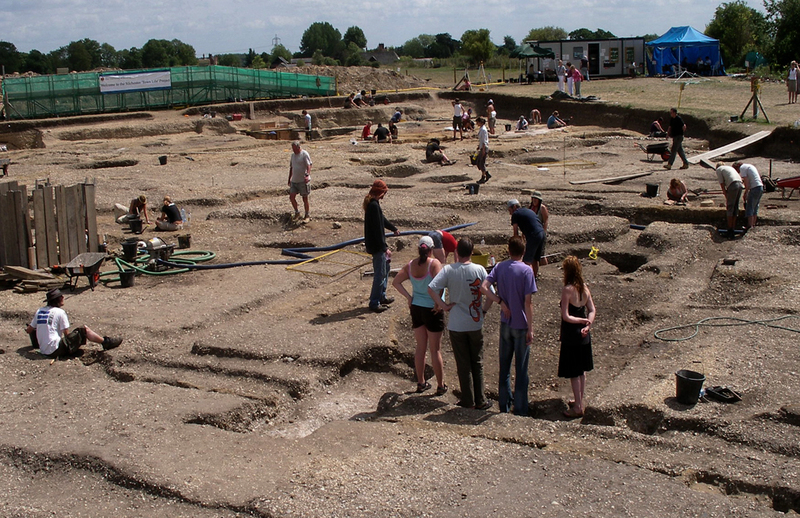 The excavation run every summer by Dr Amanda Clarke and Professor Michael Fulford of the archaeology department at Reading University, using hundreds of volunteer students, amateurs and professionals, now in its 15th season, is rewriting British history. The banal seeds are astonishing because many came from a level dating to a century before the Romans. More evidence is emerging every day, and it is clear that from around 50BC the Iron Age Atrebates tribe, whose name survived in the Latin Calleva Atrebatum, the wooded place of the Atrebates, enjoyed a lifestyle that would have been completely familiar to the Romans when they arrived in AD43. Beer enthusiasts are using a barn in Norway’s Akershus County to brew a special ale which has scientific pretensions and roots back to the dawn of human culture. The beer is made from einkorn wheat, a single-grain species that has followed humankind since we first started tilling the soil, but which has been neglected for the last 2,500 years. “This is fun − really thrilling. It’s hard to say whether this has ever been tried before in Norway,” says Jørn Kragtorp. He started brewing as a hobby four years ago. He represents the fourth generation on the family farm of Nedre Kragtorp in Aurskog-Høland, Akershus County. The Later Stone Age emerged in South Africa more than 20,000 years earlier than previously believed -- about the same time humans were migrating from Africa to the European continent, says a new international study led by the University of Colorado Boulder. The study shows the onset of the Later Stone Age in South Africa likely began some 44,000 to 42,000 years ago, said Paola Villa, a curator at the University of Colorado Museum of Natural History and lead study author. 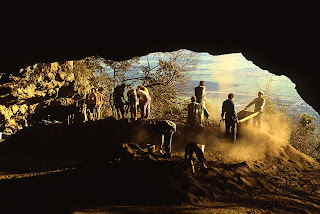 The new dates are based on the use of precisely calibrated radiocarbon dates linked to organic artifacts found at Border Cave in the Lebombo Mountains on the border of South Africa and Swaziland containing evidence of hominid occupation going back 200,000 years. The Later Stone Age is synonymous to many archaeologists with the Upper Paleolithic Period, when modern humans moved from Africa into Europe roughly 45,000 years ago and spread rapidly, displacing and eventually driving Neanderthals to extinction. 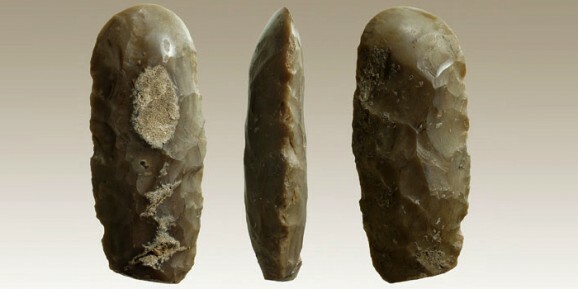 The timing of the technological innovations and changes in the Later Stone Age in South Africa are comparable to that of the Upper Paleolithic, said Villa. A beautiful and colossal human sculpture is one of the latest cultural treasures unearthed by an international team at the Tayinat Archaeological Project (TAP) excavation site in southeastern Turkey. A large semi-circular column base, ornately decorated on one side, was also discovered. Both pieces are from a monumental gate complex that provided access to the upper citadel of Kunulua, capital of the Neo-Hittite Kingdom of Patina (ca. 1000-738 BC). 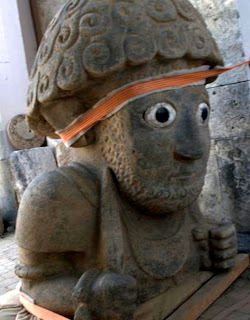 "These newly discovered Tayinat sculptures are the product of a vibrant local Neo-Hittite sculptural tradition," said Professor Tim Harrison, the Tayinat Project director and professor of Near Eastern Archaeology in the University of Toronto's Department of Near and Middle Eastern Civilizations. "They provide a vivid glimpse into the innovative character and sophistication of the Iron Age cultures that emerged in the eastern Mediterranean following the collapse of the great imperial powers of the Bronze Age at the end of the second millennium BC."